We are thankful to God that our travel here to Ukraine went smoothly this past January. Hans enjoyed flying and took it in stride. We continue to be both thankful and amazed at his ease in traveling. He marveled at being in an airplane. He enjoyed watching all the people and all the activity involved with air travel. Hans quickly adjusted to the time change and a new sleeping schedule upon our arrival, more quickly then his parents. We are thankful in how easily he transitions between cultures and languages. Tiszaujvaros, Hungary, June 25-29: We were first introduced to the church congregation of the Hungarian Reformed Church of Tiszaujvaros after they graciously came to our aid when our van broke down along a highway in eastern Hungary. We were invited to come to partner with them in starting a summer English camp ministry. Four years later, we continue to return to this congregation every summer and we are thankful to see this camp and outreach grow each year. This year 35 students attended this camp. Vachartyan, Hungary, July 2-6: This small village is located not far from Budapest and very close to the beautiful and famed Danube Bend. This year marked the 10th anniversary of partnering with both the neighboring Vachartyan and Erdokertes congregations. Every year we look forward to having home stays with families from the two churches. We have been richly blessed to work with Pastor Barnabas and his wife Livia for the past decade. We cherish their friendship and praise God for the love that they so warmly extend to those they minister to. We have been blessed to get to know so many of the families and students from these communities. We welcomed close to 60 kids this year to this camp. Nagydobrony, Ukraine, June 4-8: This was our second year organizing a summer camp at the Hungarian Reformed boarding school located in Nagydobrony, Ukraine. Nagydobrony is a large Hungarian minority community in Transcarpathia Ukraine. The English teacher at the school is a long-time friend of ours who I met at as student when I first came to Ukraine many years ago. We had 90 students of the Reformed boarding school attending the week-long camp. Peterfalva, Ukraine, June 10-21: The summer camp in Peterfalva is our original and longest running summer camp ministry. Peterfalva is the village where we live and the primary community that we work with. 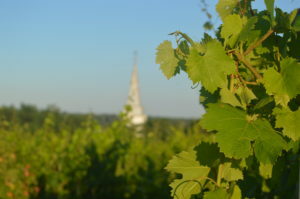 Peterfalva is also home to a Hungarian Reformed Church boarding school. 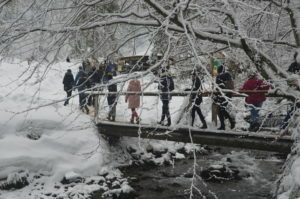 Two unique aspects to both the Peterfalva and Nagydobrony camps is that all students are required to take part in an afternoon service project in their home communities. 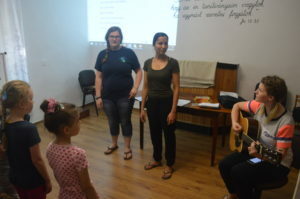 In Nagydobrony students sing, visit and lead a devotion with elderly residents of a nursing home, while in Peterfalva students take part in an outreach to Roma children in a local Roma camp, and visit elderly and widows in their homes. We welcomed a team from Redeemer OPC in Ada, Michigan for the Peterfalva Camp. It was a pleasure to partner with Redeemer OPC and in particular the team that came; they were a rich blessing for us and for the students of Peterfalva. Another summer has come to an end and with it another exciting season of summer English and Gospel outreach camps have drawn to a close. We rejoice that this marks 11 years of teaching English and sharing the Gospel through summer camp ministries. We praise God that what started as one summer camp ministry at the Peterfalva Reformed High School in Transcarpathia, Ukraine has now grown into eight different English/Outreach camps in four different countries across Eastern and Central Europe. God is faithful and we were blessed with wonderful experiences and safe travel as we traversed through Ukraine, Hungary, Croatia and Romania. We are thankful for this opportunity to serve churches and communities, teach English, and most importantly to share the Gospel of Jesus Christ with hundreds of young people. We hope and pray that the Gospel impacts these young hearts and minds and through the power of the Holy Spirit, these young people will be a faithful and godly generation. We believe that it is very important to partner with and encourage the local schools, teachers, churches and pastors of these communities. Our summer ministry camps consist of three components. conversational English lessons, games/activities, and singing/devotion times. We enjoy these opportunities to meet and develop relationships with these students, and most importantly we are thankful for the opportunity to share the Gospel and the love of Christ with these young people. Each year the LORD meets our needs by providing for us in various ways. 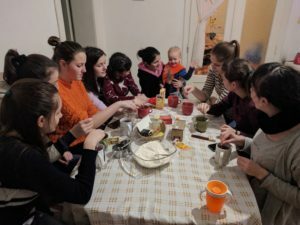 One such gracious provision is the volunteers who give of themselves – their time, their energy, their kindness, their patience, their love, … We could not do these camps without God providing the right people to work alongside us, ministering to the young people of Central and Eastern Europe. We would like to say a special thanks to Willianne Voogd, Carrie Rice, Nathaniel De Vries, Jenna Van der Pol, Erik Voogd, and the team from Redeemer OPC (Skip and Jan, Jessica, Julie, Kristen, Beka, and Laurie) for their willingness to travel and spend their time and energy volunteering with us and partnering with us through these summer outreach ministries. We are also very thankful to God for the many local pastors, teachers, school staff, translators and all the other many people who helped make this summer possible. Recently on a Saturday evening, girls from the 11th class of the Peterfalva Reformed Highschool came over to our house to bake cookies with Stacey. Students at the school go home every other weekend but remain at the school on the alternating weekends. We often try to come up with something we can do with them on weekends they remain in the school. Stacey found a recipe for classic chocolate chip cookies. Chocolate chip cookies are, of course, best when they are warm and fresh out of the oven. The girls enjoyed baking with Stacey and then they enjoyed eating the final product. We played a lively game of Spoons around the kitchen table, and Hans without a doubt relished not only the company and excitement, but also the opportunity to stay up an hour past his bed time. 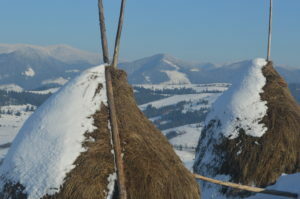 It has been an unusually mild winter in Transcarpathia. Snow has been scarce. Nonexistent really, nothing but the occasional dusting of snow. Even as you gaze east on a clear day towards the Carpathians Mountains, the foothills have sparse amounts of snow. Only the higher peaks, the most distant the eye can see have copious amounts of snow. The weather has seemed to be more March like than you would expect to find in the month of January. Legendary tales of the winter of 2018 will not be told around dinner tables in the coming decades. The Snowdrop flower, the earliest flower of the season which typically springs up from the ground at the first melting of the snow, has appeared even before February made its entrance. We enjoy the cozy and quieter winter months. I am thankful we have been able to have two different opportunities to go to the Carpathians Mountains and experience some genuine winter days. The first opportunity came with our trip to the mountains during the Pella Winterim trip. We traveled there with a combination of Pella Christian and Peterfalva Reformed High School students. Thick and heavy snow flakes began to fall as we drove into the mountains. The next morning, we awoke to a fresh pristine blanket of snow. 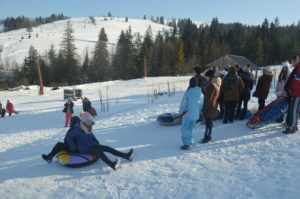 Our second opportunity to visit the mountains this winter was on the annual sledding day the Peterfalva Reformed High School organizes every January. It was a beautiful day; the sun was shinning brightly as the students went up and down the sledding hill. It was a great opportunity to spend time with teachers and students alike with the gorgeous wintry backdrop of the Carpathian Mountains all around us. Standing on top of a mountain with snowy peaks as far as the eye can see has a way of making a person stop and gaze in awe, marveling at God’s creation and softly pondering His handy work and His majesty. In the quiet and pristine beauty of the mountains to be reminded anew that without a doubt creation speaks of the existence of God as Paul writes about in Romans. 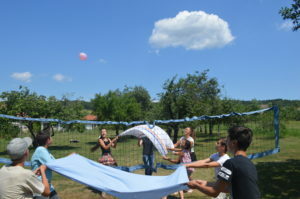 Summer Camps are partnered with either Christian schools in Ukraine or in partnership with Church congregations in Ukraine, Hungary, and Croatia. We looked forward to hopefully adding a church partnered camp in Romania this coming summer as well. These week long camps that are partnered with churches are an outreach to the people of the local community which the church serves. We praise God for this opportunity and we thank God for these weeks spending time with hundreds of young people teaching English to them, but more importantly having an opportunity to share our faith and the Gospel of Jesus Christ with many young people. Here is a look back at last summer’s four camps that took place in cooperation with churches. II. Vachartyan is an old village, near the storied Danube Bend region of Hungary. Vachartyan and the neighboring town of Erdokertes, sister congregations led by the same pastor, Barnabas Gergely, are both bedroom communities of Budapest due to their proximity of being within 45 miles of the capital city. 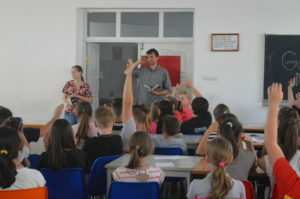 In Vachartyan we have been working with pastor Barnabas and his wife Livia for 10 years conducting an English outreach camp for local middle school and high school students of their church and community during the first week of July. We are always welcomed with generous hospitality and we have enjoyed over the last decade getting to know many people in these communities. We and our volunteers stay with host families from the both the Vachartyan and Erdokertes congregations helping us get to know many families over the past years. We also enjoy working with David and Grace McBrier, American missionaries living in the nearby city of Vac. They have many interesting outreach programs including a softball/baseball ministry, women’s retreats, and as Grace is an excellent cook and baker they are often hosting people at their home. David is also a carpenter and every year David and Grace lead the students at the Vachartyan camp in a week long building/craft project with a Gospel theme. At the end of the week all of the students have built a souvenir to take home with them. Another interesting side note to our Vachartyan camp is that it is the home town of our volunteer David Guba’s grandparents. He first heard about us and the camp through a google search while researching his ancestors home village. This past year during the camp he lived with cousins who still live in Vachartyan. III. Tiszaujvaros is also a small city on the Eastern end of Hungary. Tiszaujvaros has a very different history and very different settings today than Vachartyan. Tiszaujvaros is a very new city, having been created in farm fields along the Tisza river in the 1950’s as a model communist industrial city. Due to its history and recent creation, the city never had a church until the late 1990’s. We have been working with the Tiszaujvaros congregation in a similar fashion for only the past three years. We can see the LORD’s providence at work in how we came know the Church and Congregation in Tiszaujvaros. Four years ago, on a dark February night, while traveling with a group of students, our Volkswagen van broke down near their church and their subsequent kindness, care, and aid met our unfortunate predicament. They welcomed us that evening with such hospitality. They had been praying for a way to start an English camp ministry and we were an answer to that prayer, stranded on the side of the highway that cold dark snowy night. 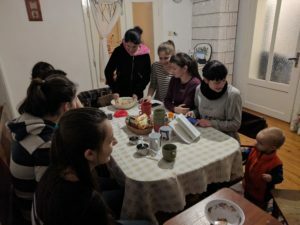 We have enjoyed partnering with Aranka and Laci and their ministry in Tiszaujvaros and like many other places, we have enjoyed meeting many people in the church community. We are blessed to be serving these churches and their ministry to their communities through helping them organize these summer Gospel outreach/English camps. IV. Vorosmart – Our week-long camp in Vorosmart is unique to us. It is not an English camp and it is our only camp to date that happens outside of the borders of Hungary or Ukraine. Vorosmart is a small ethnic Hungarian town in north eastern Croatia. The camp is a Bible camp in a Vacation Bible School format. Middle school and high school students attend from 9am until 3pm for periods of devotions and singing, small group discussions, and games and crafts. The other unique aspect of this camp for us, is that the camp is mostly led by university students that we take from Ukraine. We help organize it and provide the logistics and we and other native English volunteers help lead the devotions and help with games, but by in large the camp is run by Hungarian university students from Ukraine. It is truly amazing to see God at work, using these young people to reach out and share the Gospel with others. We are always welcomed and hosted by Pastor Gyorgy Varga and the congregation. This past year we enjoyed delicious dinners every evening made by ladies in the congregation. 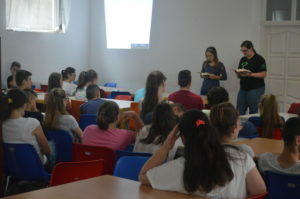 Nagydobrony – For the first time this past summer we held an English/outreach camp in the town of Nagydobrony, Ukraine at the Hungarian Reformed Boarding School in the village. The school is one of three Hungarian Reformed boarding schools in the minority Hungarian population of the western Ukraine, the province of Transcarpathia. Transcarpathia, part of Hungary for a thousand years, still has an active minority Hungarian population and many Protestant churches. The English teacher at the school, Magdolna Borovszki, a Peterfalva Reformed High School graduate, is a close friend of ours who was a student and former university Bible Study attendee, dating back to my first years visiting Ukraine. Nagydobrony is 50 miles, but a grueling nearly two-hour drive from our home village of Peterfalva, and is one of the largest Hungarian settlements in the Transcarpathia region. We immensely enjoyed traveling there for our week-long camp filled with devotions and singing, English lessons, games and activities, and capped off with a bonfire on a beautiful early summer night. It was wonderful to meet many new students and teachers. This was our first camp of the summer, beginning in the end of May, and was a great start for our volunteer teachers. The town of Nagydobrony is home to a Christian Nursing home. Nursing homes are uncommon and a Christian nursing home is very unique. 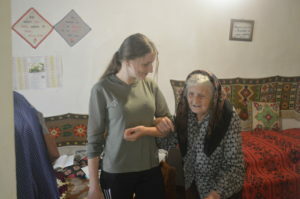 As part of the camp we walked over every afternoon with a group of students to sing and visit the elderly residents. The residents enjoyed it and hopefully the students did too. An evening of Hungarian Folk Dancing.One other highlight for us was to have a folk dance evening in Nagydobrony. Some area folk dance instructors came and taught all of us different Hungarian folk dances. We are thankful to the Nagydobrony school, the teachers, and community for welcoming us and partnering with us during this English camp. Volunteer Sarah Slager from North Carolina leads devotions. Peterfalva – Peterfalva, the small agrarian village in Western Ukraine we call home, was the location of our third camp of the summer. This also marked our second camp with a Hungarian Reformed Boarding School. Around 100 students from the Peterfalva Reformed High School attend the camp. The camp is a required part of the school curriculum. The school year runs from September through May and the month of June is designated for language camps. 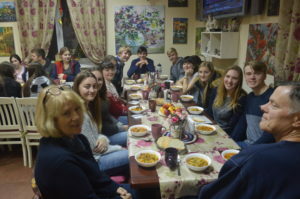 The students take part in our two-week English camp as well as a two-week Ukrainian language camp. Despite the setting of a Christian boarding school, the camp is still an excellent opportunity to share the Gospel and the hope that is ours in Christ. Also, it is a great opportunity to live our lives as a Christian example of what it means to follow Christ. You may be wondering, what does a day in a boarding school camp look like? The day is broken down into four different types of events. Devotions & Singing, English Lessons, Service Projects, and Games & Activities. Devotions and Singing occur every morning and evening. We take turns as volunteers leading the devotions by sharing the Gospel, speaking about our faith, sharing a favorite Bible passage or a devotion or something that the LORD has been teaching us. The devotions are translated into Hungarian by an English teacher or a local university student who is helping with the camp. Every morning is filled with English Lessons from after breakfast until lunch. Volunteers from North America prepare and conduct English lessons for the students. The lessons are an opportunity for the students to advance in their English language abilities, which with a greater knowledge of English will help them find better jobs and opportunities later in life. Many of the English Lessons are also centered around topics of faith and the Bible. Afternoons are filled with Games & Activities and Service Projects. Every student is required to take part in one Service Project throughout the course of the two-week camp. The service projects involve spending an afternoon visiting elderly and widows in the Peterfalva community; singing, visiting, reading the Bible and praying with them. 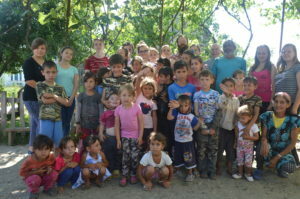 The other opportunity is to volunteer for an afternoon at the local Roma kindergarten organizing games, songs, and a Sunday School message for these young Roma children. One day we went to the Roma kindergarten and organized a lunch for the children. Pastor Elemer Barta cooked the famed Hungarian goulash over an open fire and students from the Peterfalva Reformed High School, children from the Roma kindergarten and their teaches, and North American volunteers all enjoyed games, lunch, and fellowship together. Evenings during the English Camp are filled with with many different activities for the students. During the course of the two week camp we organize the students into activity teams. The students choose a team name and make a poster representing their team. Throughout the two week camp the teams compete against each other in many games and activities and at the end of the camp an activity team is crowned champions and rewarded for their efforts with chocolate. 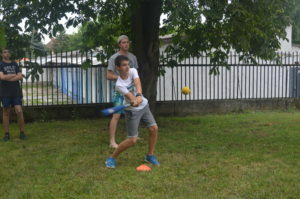 The student teams compete in Ultimate Frisbee, water games, a scavenger hunt, a trivia competition, organize skits and do many different other activities. This camp is a busy two weeks but always richly blessed by God and a rewarding experience we are thankful for. 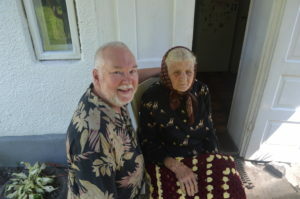 One exciting thing to happen this past year was one of volunteers David Guba, from Alberta, Canada brought with him an entire suitcase full of blankets, gloves, and winter hats that his mother had knitted. David gave these items to many teachers and cooks at the school and he was also able to give them as gifts to elderly ladies of the community who the students visited in the afternoons during the camp. Earlier this week, Stacey and I were able to visit Mariska-neni, a 92 year old woman in our village who the students visited last summer. The blanket made by David’s mother was on her bed and she proudly retold the story of how she received it during the English camp. We are thankful to both David who carried an entire extra suitcase and to his mother who must have given countless hours to make the blankets and hats. We are again thankful to God for all the volunteers from North America this past summer. We are thankful for their willingness to come and serve and give of themselves and their time. We are also thankful to Reformed Mission Services for helping us find volunteers. We were also very thankful to Csilla Kodobocz, David Hidi, Zoltan Toth, Krisztina Bosckor, Eszter Kucsinka, and Kamilla Kelemen (university students) who helped as translators and classroom assistants. We also were thankful to Irenke Kalincs, and Magdolna Borovszki the respective English teachers we worked with in Peterfalva and Nagydobrony. We are thankful to the administrators, dorm parents, cooks, cleaning staff, and everyone else at both schools who made these weeks possible. We appreciated the efforts of so many people to be able to organize and conduct summer camps in both Peterfalva and Nagydobrony at the Hungarian Reformed boarding schools. Soli Deo Gloria! Follow the link below to see more pictures. Going to summer camp is something much different in the mind of an Eastern European youth than it is to their North American counterpart. If the average North American’s youthful years were anything like mine, then summer camp was something special and unique. Summer camp was a getaway, a vacation, a week away from home full of adventure. Summer camp days were filled with swimming, outdoor games and programs, singing around the campfire, camp counselors, and sleeping in cabins or tents. Camp was an expensive luxury that did not come every year and something so unique that I only did it twice in my entire youthful existence. Hardly did I think that I was underprivileged or that I was being deprived of something that all my friends were doing, or that my parents were unfair. These thoughts never crossed my mind. It even seems my two summer camp experiences were a tick above average when compared with childhoods of friends and family. Sometime around my 10th year of life I spent a week at a camp outside of Grand Rapids, MI. This was followed some years later during middle school by a trip to the northern Michigan woods with our church’s Cadet Club to join thousands of other Cadets from around North America in the Cadet Camporee. Cadets was a Calvinist version of Boy Scouts and every few years cadet clubs from Christian Reformed Churches from around North America would meet for a massive camp. These two staggered and thrilling events left me with fond memories, but these few short days fitting into less than two weeks completed my life experience of summer camps until I went to Ukraine. Despite being the same words, summer camp, means something drastically different to the average school aged child or teenager in Eastern Europe who is likely in any given summer to attend multiple summer camps. Summer camps are inexpensive and educational, sometimes even mandatory extracurricular summer learning required by a school. The rare student might attend a camp that their North American contemporaries would call summer camp. But not many. Some high school students and youth groups go to church denomination camps where they meet with hundreds of other youths in a sort of convention/camp. The vast majority of summer camps are language, faith and Bible, art, music, and folk-dance camps put on in local communities by area individuals, churches, or schools. To be fair, the typical Bible or faith camp resembles what I would have grown up calling Vacation Bible School. However, Bible or faith camps tend to be a much larger production and often involve participants spending the entire day and even sleeping on site and spending the entire week at the faith or Bible camp. Our summer camps fall into two of the summer camp categories. Language and faith. Our camps are English/Outreach camps where students learn English and also hear the Gospel. Our camps also fall into two different styles. Some camps are required extracurricular summer learning within a school for the students of the school. Other camps are partnered with churches as an outreach for the people of the local community which the church serves. This summer we enjoyed organizing and conducting six summer camps in three different countries. We praise God for this opportunity and we thank God for these weeks spending time with hundreds of young people teaching English to them, but more importantly having a chance to share our faith and the Gospel of Jesus Christ with many young people. We were once again blessed with a wonderful team of volunteers from both the U.S. and Canada who came and lived out and shared their faith through both word and deed, teaching English, leading devotions and singing, organizing games and activities, and many other things. A big thanks to David Guba, Nathaniel de Vries, Sarah Slager, David Lammers, Sandhya Poelman, Anya Boekestein, Willianne Voogd, Nathan Bloechl, Jerry Janney, Ben McFarland, Carrie Rice, Isaac Boerema, Csilla Kodobocz, Alexandra Krizsan, Ferenc Suto, Boglarka and Elemer Olah; all who traveled many miles and spent many weeks with us this past summer. Also, we would like to express our gratitude and thanks to the teachers, university students, translators, pastors, cooks, and many other helpers and individuals who gave so much of themselves in making these camps happen. Volunteers visiting Lviv on a free weekend. One of greatest and most rewarding parts of our ministry is to see former students and Bible study attendees finish their studies and become a new generation of leaders in the workforce of their communities, schools and churches. We praise God for invitations and increased opportunities to work with more schools and churches as we see old students from years gone by who have attended our camps, Bible studies, and English classes who finish university and seminary and who now have churches, or classrooms of their own. What a testimony to God’s faithfulness to see students grow up and continue to walk with the Lord in faith. How wonderful it is to serve the Lord and partner alongside these young adults in the churches and schools they now have been called to serve in. Increasingly, we are getting invitations to begin outreach camps alongside former students who were once camp attendees themselves. 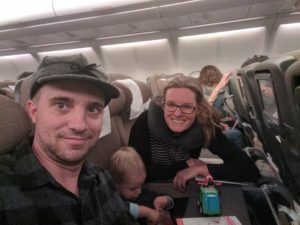 We arrived back to Eastern Europe on December 29. It was a busy start for us as we had a group from Pella, Iowa come for a visit from January 2-13. The group consisted of 15 high school students and 5 chaperones. 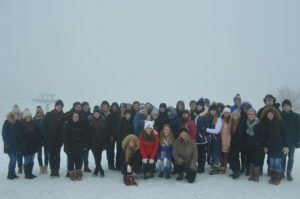 We happily agreed to organize a Winterim class trip from Pella Christian High School to Ukraine, Hungary, and Poland. Winterim is a program done by Pella Christian Highschool as well as other Christian schools and colleges. Before the start of the winter/spring semester the school offers special off campus short term classes and special focus short-term classes on location at the school. From our perspective, the class/trip went very well. It is always a pleasure for us to have visitors and to be able to show this fascinating corner of the world to people from North America. As part of the trip we organized a joint Pella/Peterfalva student trip to the Carpathian Mountains of Ukraine. Pella Christian High School and the Peterfalva Hungarian Reformed high school have developed a relationship over the past years. We have had a number of volunteers from Pella come for summer English camps to Peterfalva, and Pella Christian has hosted three different exchange students from the Peterfalva Reformed High School. It was great to be able to take Pella students to Ukraine and to show them the high school here. 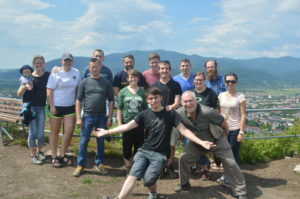 We organized an off-campus trip to the mountains with 15 Pella students and 16 Peterfalva students as well as chaperones from each school, and 6 local university students who acted as helpers and translators. We visited a WWII bunker, the top of a mountain, a castle, and a famous waterfall. It was a great opportunity for the Peterfalva students to practice speaking in English as they interacted with Pella students. We hope the Pella students were able to learn about the culture, heritage, history and educational system here in Transcarpthia. that the students were encouraged in their faith and relationship with Jesus over the course of the days we spent together. 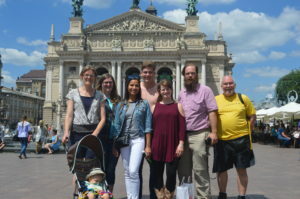 Following the time in Ukraine we traveled with just the Pella group to Budapest, Hungary spending time there exploring and learning about the history of the city and of Hungary. We were able to worship on Sunday with the Erdokertes, Hungarian Reformed Church, who we partner with in one of our English/outreach camps. We were welcomed with such hospitality and a delicious meal following the morning service. We went on to Poland to visit the cities of Warsaw and Krakow as well as the concentration camp in Auschwitz. We hope it was a memorable and life changing trip for these students (I think only one student had ever been out of the U.S.). We hope they were all impacted by the fellowship, history, culture and opportunities to share their faith. We also hope some of the Pella students when they get of university age will consider coming to volunteer in our camps in the summer time and spend more time in this fascinating corner of the world. It is really amazing to witness Christ’s dominion over all corners of the earth, and how He builds His kingdom! 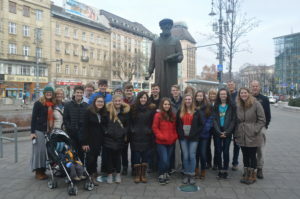 Pella Christian Students with John Calvin on Kalvin Square, Budapest, Hungary. Below, students in front of the Hungarian Parliament.